How do I change the leave type which is selected by default when requesting leave? 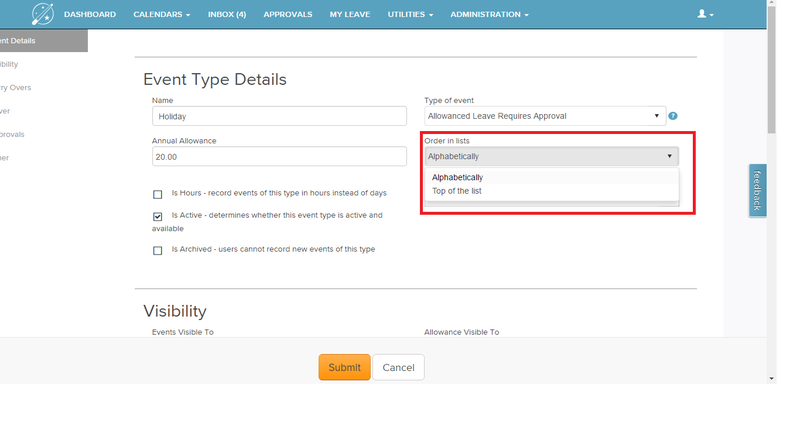 Simply go to "Administration | Event Types and Allowances", select the leave type that you wish to be at the top of the list. Click "Edit Event Type". In the Event Details section you should see an "Order in list" option. Change this to "Top of the list" and then click the submit button. I am not able to login, what should I do? As an Employee how do I cancel a leave request? As an Administrator how do I cancel a leave request? How do I hide certain employees from lists and charts? Can we use our own logo? How do I re-activate employees? I cannot delete an event type because it has previously been used to record leave events. Where do I see the events of this type? How do I set up an event type that is bookable on weekends? We have integrated Outlook however events seem to disappear after some time. Can we get these back? How do I remove the restriction on the allowance of a leave type? A leave type is included in the monthly allowance report but it should not be. How can I remove it? I am seeing some regional language in the calendar , How do i get it in English? I am not able to see public holidays in my leave calendar, What should I do? How do I restrict staff to only request holidays for the current holiday year? How do I assign a PA for applying leave on someone's behalf? How do I assign an admin account to be an approver? How do I let employees know their login and how to access leavwizard? My allowances seem wrong, what could the problem be? How to merge Outlook calendars and how to overlay and import new ones. How do i set a minimum notice period in the system.